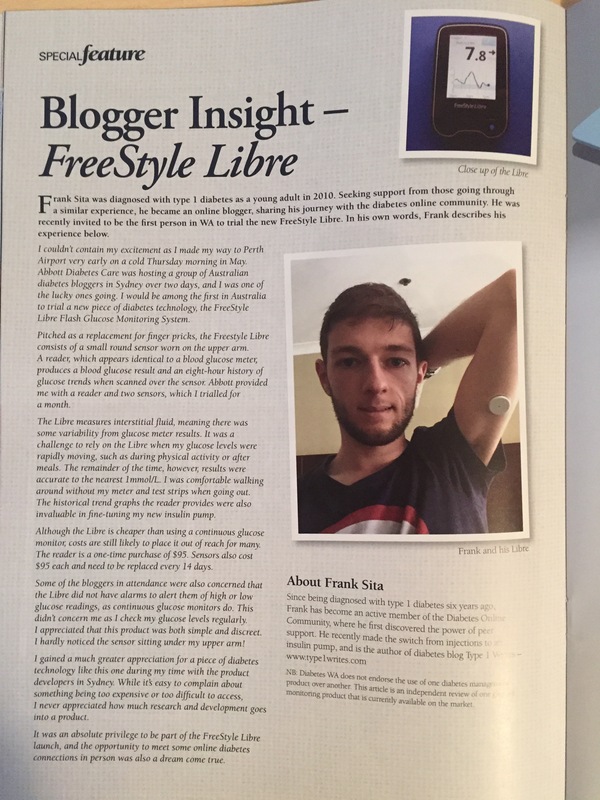 I’m thrilled to be featured in the Diabetes WA magazine Diabetes Matters, discussing my experience as the first person in Western Australia to trial the FreeStyle Libre Flash Glucose Monitoring System earlier this year (which I wrote about here). Seeing myself in print is so surreal! Usually I’m the one reading articles about old classmates who are athletes and sportspeople and superheroes. When I started writing a diabetes blog two years ago, I never imagined that I would be able to call myself an advocate for a cause I am really passionate about. Special thanks to the team at Diabetes WA for featuring my story. Check out my article below, and be sure to grab yourself a copy, Perth folks! Congratulations! Exciting moment for you and well deserved. Congrats, I always say I can always use publicity. As a former politician i figured the only thing bad about publicity was when they spelled my name wrong. My mom felt it was bad when they spelled my name correctly.